Naren Instruments & Enginering Co. Matching up with the ever increasing requirements of the customers, our company is engaged in providing High Temperature Thermocouple. 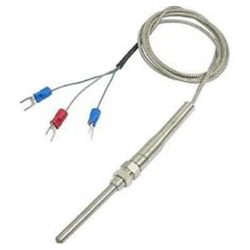 Tempco - high temperature thermocouples are manufactured for temperatures up to 2000 ° C.
In a large extent these thermocouples are used in aerospace, research laboratories and industry. For the various areas are suitable sheath materials, thermocouple combinations and insulating materials available. - Type: Thermocouple Calibration such as R, S, B. Type ‘R’ (Pt. Rh. 13% - Pt.) & Type ‘S’ (Pt. Rh. 10% - Pt.) are used to measure temperature upto 1400ºC/1600ºC maximum. Type ‘B’ (Pt. Rh 6% - Pt. Rh 30% or Pt. 18) are for temp. upto 1800ºC max. Thermoelement pair is protected by two or three ceramic sheaths of various types depending upon working temperature and environmental conditions.